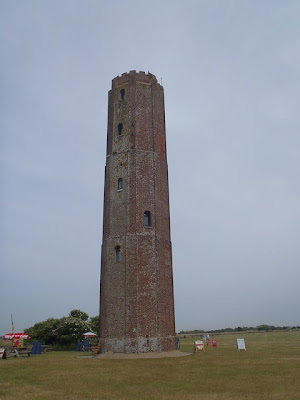 The Naze Tower at Walton on the Naze is an 86 foot tower built in the 1720s by Trinity House to aid ships navigating along the Essex coast, and to line up with Walton Hall as a guide for ships passing through a gap in the offshore shoals known as Goldmer Gap. Today, visitors can climb the tower for a very reasonable £2.50 and there is also a tea rooms on the ground floor, and 1st and 2nd floors, as well as plenty of art for sale and fantastic panoramic views into the Walton Backwaters, and area of creeks, islands and marshes made famous by author Arthur Ransome in his book ‘Secret Water’. When your author visited earlier in the week those working at the tea room also firmly recommended boat trips to see seals in the backwaters with Tony Haggis on the boat Karina, which they had recently taken.